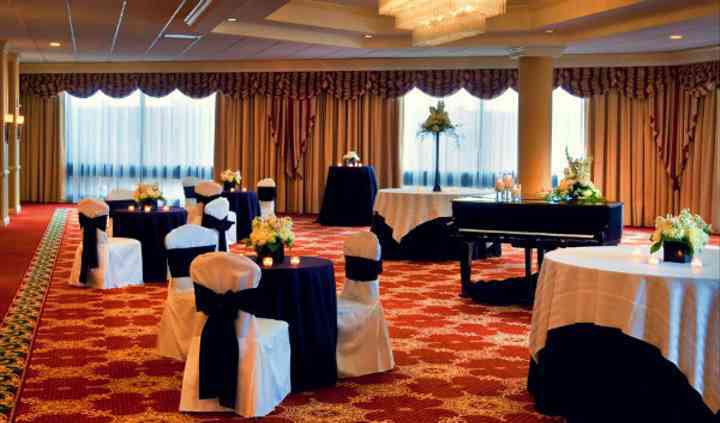 Tower Square Hotel Springfield is a romantic, elegant ballroom located in Springfield, Massachusetts. 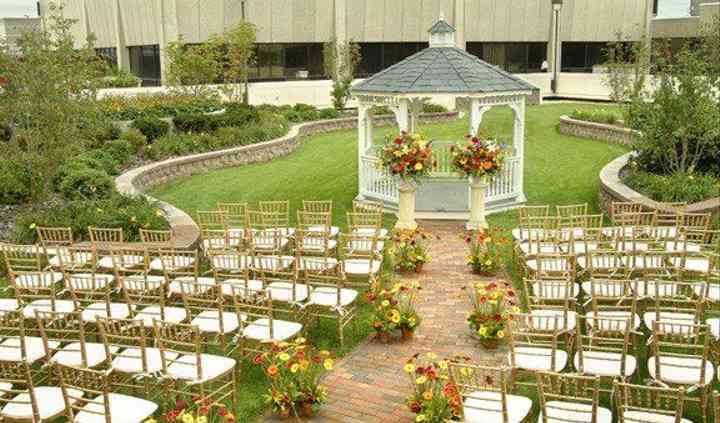 If you’ve imagined a fairytale outdoors wedding in western Massachusetts, Tower Square Hotel Springfield brings this vision to life in the carefully curated courtyard, which includes a charming gazebo. On top of a fabulous wedding experience, this venue doubles as a hotel, which means you won’t need to look for accommodation for your guests. Beginning outside in the courtyard, you’ll walk down the brick walkway towards the quaint gazebo that is nestled in a lush garden. From there, you will celebrate in The Grand Ballroom for the reception. 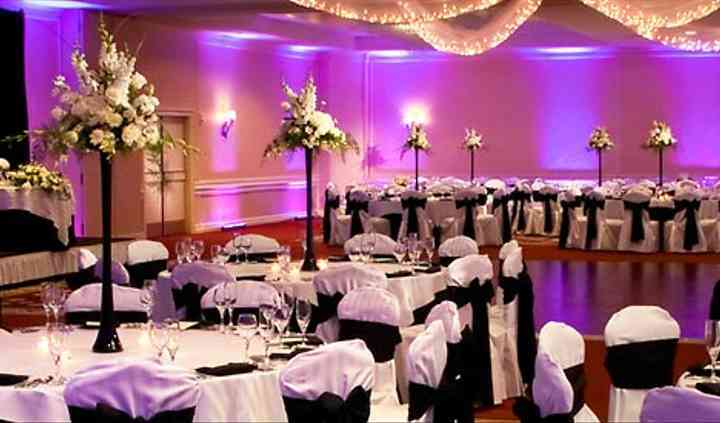 The Grand Ballroom has plenty of room for themes and lighting ideas to come to fruition. Tower Square Hotel is flexible with decorations, ensuring your wedding is what you wish. 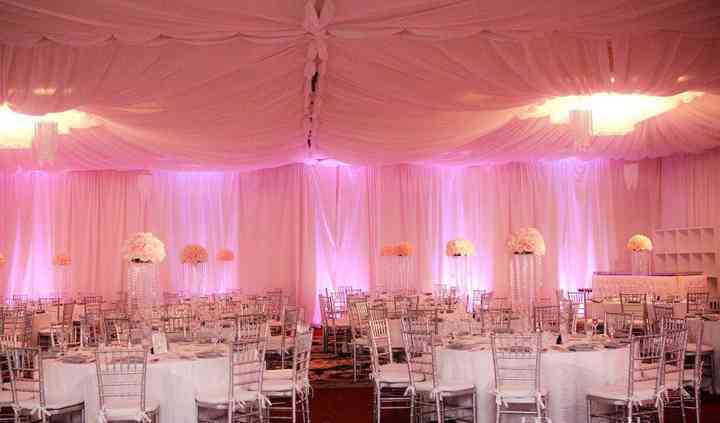 Curtains can be draped all around for a more romantic, classic style or maybe the use of low lighting is what you wish. This venue has up to 13 event spaces and can accommodate up to 350 guests. If you’re planning a big wedding in western Massachusetts, check out this venue. The staff at Tower Square Hotel Springfield will offers assistance with event planning, as well as the setup and clean up of your event. This hotel offers an in-house catering service and an in-house bar. You can choose from family style, themed buffets, stations, or plated service. Your wedding guests will be taken care of Tower Square Hotel Springfield. Guests will be offered special discounts and group rates when booking rooms for your wedding. Blocks of rooms can be reserved no matter what size the wedding is. The staff wants to make sure your guests are nice and relaxed during their stay, so guests are invited to utilize the state-of-the-art fitness center, indoor pool, and whirlpool. Our experience with the Springfield Marriott was wonderful! Their packages include the cake and the flowers for the reception which made the whole planning process easier and cheaper. Our event ... Read more coordinator, Sarah was great. We provided a lot of our own decor and the staff was very creative and did a wonderful job setting everything up. They went above and beyond. Our guests raved about how wonderful the staff was. It was also very convenient for our guests to be able to stay right there. They gave us a great discount on the rooms for our guests. Our wedding took place the same weekend as The Basketball Hall of Fame weekend. Our wedding was quite large and the service was great even thought there were two large events going on. Wonderful!